All 20 installments in the Marvel Cinematic Universe will be returning to theaters for a special film festival celebrating 10 years of Marvel. 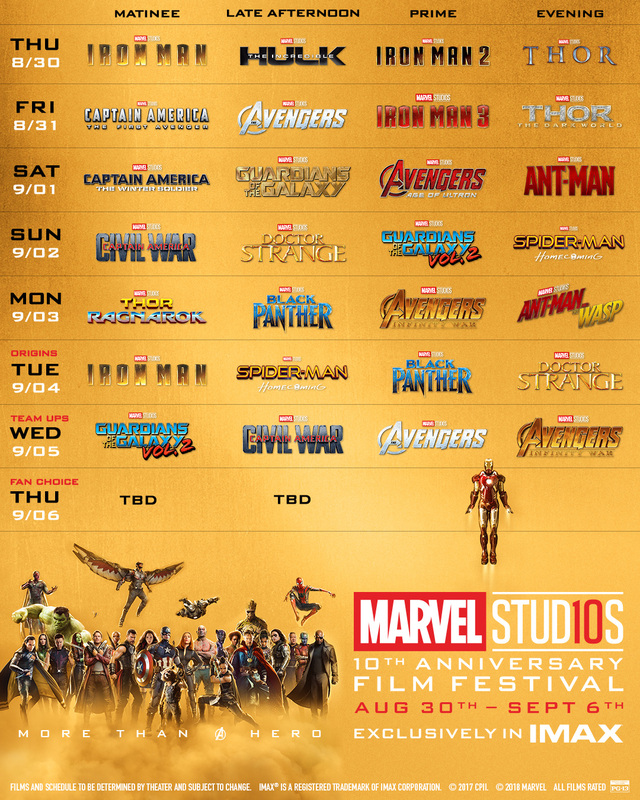 Starting Aug. 30 and running through Sept. 6, Marvel is airing all 20 films in order, from 2008’s Iron Man to the just-released Ant-Man and the Wasp. Each film will screen exclusively in IMAX. Three of the films — Iron Man, The Incredible Hulk, and Captain America: The First Avenger — will be shown for the first time on an IMAX screen. Each film will screen in order, followed by two theme days celebrating origin stories and team-up movies. You can view the full schedule below and for more info and to buy tickets, click here.